Grass heads to New York! Whilst we're in New York, Claire is heading to Edinburgh International Children’s Festival for the week, so if you’re also going to be around do say ‘Hello’. We are currently seeking dancers for a new production, The Night Tree. The Night Tree will be an adaption of the book by the same name by Eve Bunting. The story explores the beautiful journey of a family who go into the forest and decorate a tree for Christmas with edible decorations for the birds and animals. We are looking for 1 performer who is confident in contemporary dance technique, devising, collaborating and has a confident singing voice. A desire to work on a family dance production is essential. We are also interested in developing relationships with dancers for future projects. The audition workshop will take place on Monday 21 May with a call-back on Tuesday 22 May 2018 in London (location TBC). Invitation only audition with improvisatory tasks and voice workshop. We aim to be inclusive in our casting and are actively seeking applications from a diverse range of backgrounds and body types. Rehearsal locations are to be confirmed. Performances will be in Canterbury and Bournemouth. Please send a CV, performance footage and a covering letter or video application explaining why you would like to work with us to rosie@secondhanddance.co.uk by 4th May 2018. Successful applicants will be notified by 15 May 2018. Please let us know in your application if you have any access requirements. Christmas has come early this year to Second Hand Dance! We’re delighted to let you know we’ve been awarded funding from by Arts Council England, through the National Lottery to make ‘The Night Tree’, commissioned by Gulbenkian, University of Kent, in association with Pavilion Dance South West. The Night Tree is a new 40-minute dance show for audiences aged 3+ inspired by the book of the same name by Eve Bunting. The piece follows the story of a family who each year celebrate the mid-winter bydecorating a tree in the forest with edible gifts for wildlife, rather bringing one into their home. The performance will be full of the sounds and smells of the winter forest, immersing families in a show that celebrates the joy of coming together and celebrating within nature. BUT… before we get too excited by seeing snow again, we’ve got some more of Spring and Summer to enjoy with other shows happening around the world! Following our Irish Premiere at Belfast International Children’s Festival we’re taking Getting Dressed back on the road again! This time Munich is calling and we'll sharing this joyful explosion of dance, clothing and daftness to Think Big! Festival. The full programmes’ still to be announced – but we’re delighted to be in some illustrious company. 2018 is the year of travel for us with trips to Belfast, Sweden and New York among others on the cards. We thought we'd welcome in the new year with a round up of where you can catch us! After performing 24 times around England, Getting Dressed is heading to Belfast International Children's Festival from the 9 to 11 March, for the company's Irish premiere. We're dusting off our hats and preparing our trousers to perform this vibrant show again, and it would be lovely to see you there. After the work's first international trip to Showbox Festival in Oslo, Grass will be growing wings to fly across to New York this Summer. This charming show explores the ground beneath our feet and the mini beasts that live there. Dad Dancing is a collaboration between Rosie Heafford (Second Hand Dance), Alexandrina Hemsley and Helena Webb. We’re delighted to say that the project has secured funding from Arts Council England to tour to 4 venues in England with co-producing support from Battersea Arts Centre. Dad Dancing is a joyous contemporary dance show exploring father-child relationships with humour and playful storytelling. Rosie, Alexandrina and Helena are joined by their dads and a supporting cast of father-figures, sons and daughters of all ages, as they share their similarities and differences, hopes and regrets to a soundtrack including Beethoven, Whitney Houston and Pendulum. Artistic Director/Choreographer Rosie Heafford and Producer Claire Summerfield will be there for the week and we'd love to meet with you during the festival. So if you fancy a chat please contact Claire - claire@tandemworks.uk / 07976 371 124 or Rosie - rosie@secondhanddance.co.uk / 07900 986 148. Second Hand Dance is very pleased to announce that we have been awarded funds from Arts Council England to make and tour 'Getting Dressed', a new dance-show for children and families in 2017. The work will premiere at Pavilion Dance South West, Bournemouth on Sunday 12th February 2017 and tour the UK until the beginning of May. After an exciting summer presenting our work-in-progress ideas at On The Edge Festival and Tanzmesse, we're now proud to be able to make the work. Aimed at ages 4+ and their families, the show will invite us all to be as creative as we can with the clothes we wear, tempting us to get dressed just a little bit differently. We've got some wonderful support for this project; it's co-commissioned by Sadler’s Wells and Pavilion Dance South West and made in association with Nottingham Lakeside Arts, Dance East, Southbank Centre, South East Dance, The Point and using public funding by the National Lottery through Arts Council England. Second Hand Dance is a Playtime Artist with Pavilion Dance South West and Company in Residence at South East Dance. What next? - Watch this space and we'll release our tour dates soon - hope you can come along! Second Hand Dance collaborates with dancers, artists and the public to make thought provoking, joyful and highly visual dance performances for all ages. 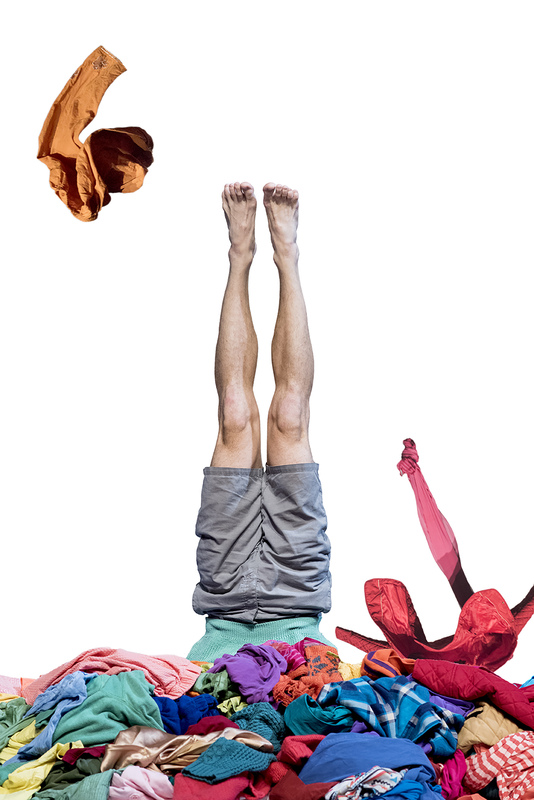 We are currently seeking dancers for a new production, Getting Dressed, for children and families that delves into the movement and humour of clothes. How you put them on, take them off, share them and express yourself, your identity and your gender. We are looking for 3 performers who are confident in contemporary technique, devising, collaborating and have a desire to work on a family dance production. We are particularly interested in performers who are confident in partner-work and lifting or with parkour/acro- experience. Getting dressed by yourself is a huge milestone as a child; developing independence and the identity we choose to present to the wider world. The work will aim to subtly challenge the conventions, peer pressures and popular culture influences children encounter when starting school. We aim to be inclusive in our casting and are actively seeking applications from a diverse range of backgrounds and body types. Audition workshops will take place on 19, 20 & 22 September in London. Audition workshops will be run by Second Hand Dance Artistic Director Rosie Heafford and internationally renowned choreographer Erik Kaiel from Arch8. We expect all audtionees to be available for the full 3 day workshop process. Monday 19 September – Open Audition with morning class, improvisatory tasks and physical workshop. At the end of the day, selections will be made for re-calls on 20 & 22 Sept.
Tuesday 20 September & Thursday 22 September – re-calls for selected applicants. A small stipend will be able for those re-called towards travel costs. Creation Period: December 2016 – February 2017. The Creation and tour period is subject to confirmation of funding, anticipated for October 2016. Please send a CV, performance footage and a covering letter (or video application if you are less comfortable writing) explaining why you would like to work with us to rosie@secondhanddance.co.uk by 11th September 2016. Successful applicants will be notified by 14th September 2016. Please let us know in your application if you have any access requirements. Second Hand Dance collaborates with dancers, artists and the public to make thought-provoking, joyful and highly visual dance performances for all ages. The work is often socially-engaged and presented in a range of spaces, from theatres to gardens, creating unique experiences for audiences. Previous projects include Dad Dancing co-produced with Battersea Arts Centre and Grass in association with the Unicorn Theatre. In 2016 Artistic Director Rosie Heafford received one of two shortlist awards at the Arts Foundation Children’s Theatre Awards. Erik Kaiel performs, choreographs and teaches throughout Netherlands, Europe, and the world. In Autumn 2016, 3 of his works are being presented by Dance Umbrella throughout the festival: Tetris, O Snap and No Man is an Island. In 2010, he won the Dutch national prize for choreographic talent, and the No Ballet competition in Germany. Current projects include a co-production with Tanzhuis NRW/Het Lab (2012), a new cross-border collaborative work with Dutch and Belgian youth, & a series of public space performances in Cairo, Denmark and Sweden. He is the artistic director of Crosstown Den Haag, a choreographic fellow at Danslab, and a faculty member at the Artez Dance Academy in Arnhem. Second Hand Dance are one of 7 British companies performing at Tanzmesse NRW, Europe's Largest Dance Trade Event. British dance artists and companies are coming together as part of a pilot project, Dance in Great Britain, which aims to promote the export potential of UK contemporary dance by presenting a number of performances, events and showcases at International Tanzmesse nrw 2016, Europe’s largest dance trade event. This event marks the first time that UK Trade & Investment has invested in a project of this kind, recognising the potential new international markets for the UK’s dance sector. Produced by Dance4 on behalf of National Dance Network, Dance in Great Britain is a collaboration between UK Trade and Investment (funded through the GREAT campaign), Arts Council England, British Council, with additional support from Wales Arts International and Creative Scotland. The project aims to raise the profile of the UK’s dance sector to an international business audience with the aim of increasing the potential for export opportunities and international partnerships. The UK’s programme at International Tanzmesse nrw includes an exciting range of performances, open studio sessions and discussion events, bringing artists and producers from the UK together to explore women in choreography, their contribution to knowledge development and the creation of new ideas and work. Open studio sessions provide artists and choreographers the opportunity to share their new emerging creations with one of the world’s largest gatherings of dance professionals. The dance artists and companies presenting works at International Tanzmesse nrw as part of Dance in Great Britain are Theo Clinkard, Joan Clevillé Dance, Second Hand Dance, Rosie Kay Dance Company, Janine Fletcher, National Dance Company Wales, and Roberta Jean / mysteryskin. Dance in Great Britain, which is under the umbrella Culture is GREAT which is part of the Britain is GREAT campaign promotes the rich cultural offer in the UK to attract tourists (supported by Visit Britain) as well as students who might want to study arts subjects in the UK (supported by British Council).